Head teachers try out solar lights at a meeting with a SolarAid sales team. Some 590 million Africans live off the electric grid, instead using dangerous and polluting kerosene lamps. With the ambitious goal of eliminating the kerosene lamp from Africa by 2020, Solar Aid’s sales teams work with headteachers in rural areas to promote good quality, affordable solar lights to families. By end March 2013, 408,000 lights had been sold. GHG emissions cut by 36,000 tonnes/year CO2 e.
2 million household members benefit from better quality light without kerosene fumes. One of the biggest challenges in getting sustainable energy to the poor is reaching the ‘last mile’ – those remote rural areas where commercial distribution and retail networks simply don’t exist. SolarAid’s ingenious distribution methods are getting power to the people who need it the most. Small solar-powered lights can have huge impact in off-grid homes, replacing costly, kerosene lamps and candles with brighter, cleaner light. The technology surrounding solar lights has greatly improved over the past ten years, and many now also charge mobile phones. Prices have come down with the falling cost of PV modules and LED lights, and international standards have helped to improve quality. But it is still an enormous challenge to get lights and backup services to the people in remote areas who would benefit most from them. SolarAid took on this distribution challenge by seed-funding a trading subsidiary, SunnyMoney, in order to catalyse a viable market for quality solar lights in remote rural areas, encourage other solar providers to enter the market, and displace kerosene. ...it is still an enormous challenge to get lights and backup services to the people in remote areas who would benefit most from them. A SKPro solar light being held by a happy customer. The UK charity SolarAid was founded in 2006, with the aim of bringing clean solar energy to the poorest people in the world. 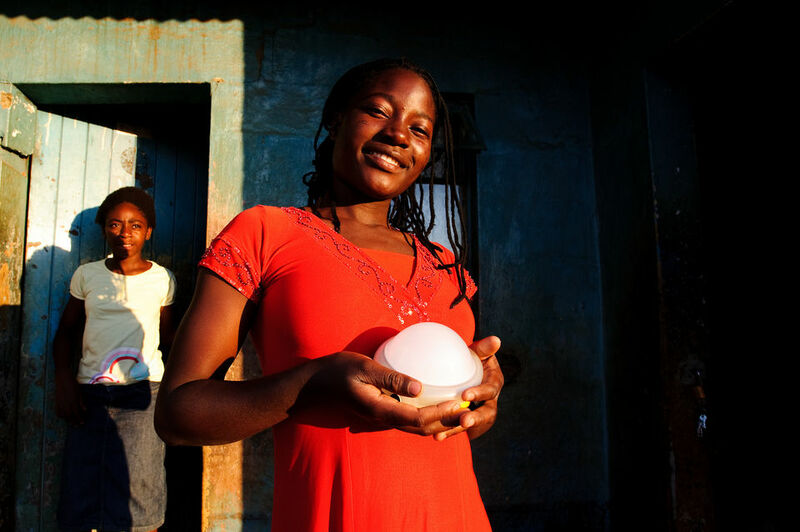 SolarAid started selling solar lights in 2007, and set up SunnyMoney in 2010 as an independently registered entity to drive forward these sales. SolarAid had 62 employees and an income of £3.58 million in FY 2012-13, with 68% from sales and 32 % from grants and donations. SunnyMoney has developed a generic sales and distribution approach over several years, which overcomes the key barriers of reaching remote areas, building consumer trust, and affordability. The programme can be adapted to work in different countries and currently runs in Tanzania, Kenya, Zambia and Malawi: it has gone furthest in Tanzania where the schools campaign started in late 2010. The schools campaign aims to promote the benefits of solar-powered study lights to the headteacher of every school in the country of operation, by working through the country region by region. 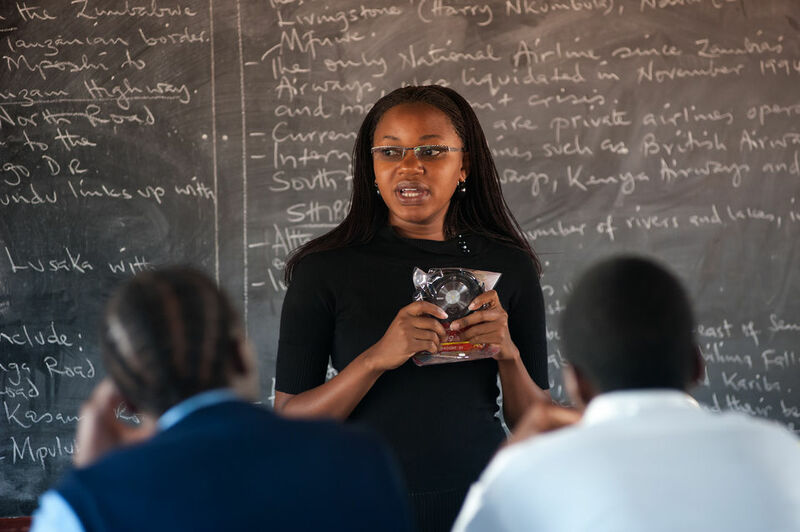 Visiting each school would take years (for example, Tanzania has over 16,000 schools), so instead, groups of between 20 and 80 headteachers in a local area are invited to a meeting with a SunnyMoney field team at a convenient central venue (often a school). At the headteacher meeting the team members demonstrate and explain the benefits of solar study lights, answer questions, then invite headteachers to collect orders in their school, with the incentive of a free study light for every 40 orders, or a larger light for 80 orders. Head teachers collect solar lights that they have ordered. Headteachers come with orders and payment, collect their lights and take them to their school to distribute. About two weeks later, the team returns with stocks of lights, for a sales meeting. Headteachers come with orders and payment, collect their lights and take them to their school to distribute. A second sales meeting is held a few weeks later to supply additional orders, giving more people a chance to save up for a light. SunnyMoney must have permission from the education authorities to carry out this campaign, but this has not been a problem: authorities in all countries have been strongly supportive. The initial approach to the regional education authority is followed by liaison with district education officers to find out details of all schools in their district, divide them into groups, and set up the headteacher meetings. Currently the schools campaign is the main work of SunnyMoney in all four countries. Direct sales have also started in Tanzania and Kenya, and will become the main focus when all schools in the country have been serviced. The direct sales programme allows headteachers (and other teachers) to order further lights, with the same incentives, after the campaign team has left their region. The minimum order is 20 lights: payment must be received in the SunnyMoney bank account before the order is dispatched by local bus. The SunnyMoney call-centre team follows up headteachers to remind them about direct sales, but many orders come independently – even from regions that have not yet been targeted. SunnyMoney field coordinator Mayase demonstrating solar lights to students. The sales come from general marketing through radio and magazines, and also from word-of-mouth recommendation. Direct sales give people the chance to save up, to buy an additional light, or replace a light which reaches the end of its battery life. They are particularly useful if the schools campaign runs at a time when money is very tight – for instance, just after school fees have been paid, or just before harvest. In Tanzania, where direct sales started in November 2012, they already account for 14% of total sales. Modern solar lights use LEDs as their light source, run from a rechargeable battery that is charged by a solar photovoltaic (PV) module. No specialist technical knowledge is needed to operate them. Currently SolarAid’s main lights are the S2 model (from DLight) which SunnyMoney promote as the lowest-cost study light for students, and the larger SunKing Pro (Greenlight Planet) which also charges phones. Small solar-home systems from Barefoot Power are also promoted. I think teachers also need this solar. because you know, they need to do preparation in the night, they have to read and write. At present, prices during the campaign range from about US$7.50 for the DLight S2, and up to US$40 for the larger lights. Prices vary somewhat from country to country, and there is sometimes a subsidy during a campaign. Prices are 15-20% higher for direct sales, since these are not subsidised, and must cover the cost of transport. A key pricing strategy is not to skew the market prior to it maturing, since it would be difficult for a developing country to recover from this. Currently all sales are cash in advance, but SunnyMoney is looking at a number of options for making staged payments. 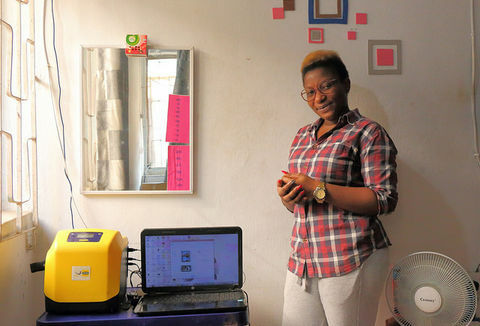 All products must meet Lighting Africa minimum quality standards and recommended performance targets, and also go through a SolarAid internal approval process. SunnyMoney purchases full containers of lights, and checks a batch from each container before distribution. SolarAid tests every batch of lights, to make sure that rural customers get reliable produces. ...current models have LiFePO4 (LFP) batteries with an anticipated life expectancy of five years or more. Customers get a warranty that ranges from six months to two years depending on the product. The expected product lifetime used to be around two years when NiCd batteries were used, but current models have LiFePO4 (LFP) batteries with an anticipated life expectancy of five years or more. A SunnyMoney sticker on light has the local phone number to contact to fulfil the warranty, or with other questions. Currently only about 1% of lights are returned, and SunnyMoney estimates that possibly 1% more may develop faults but not be returned. Progress has been rapid. By the end of March 2013, SunnyMoney had sold 408,101 solar lights. 57% of sales are in Tanzania (where the school campaign started first, in late 2010), 27% in Kenya (started in 2012), and the remaining 16% in Malawi and Zambia where campaigns are at an earlier stage. With just a few early lights reaching the end of their useful battery life, over 95% of lights sold (or about 390,000 lights) are thought to be in use. I tried out the light first with my own children – I’ve got six of them – and it was really useful to study, but everywhere else too like in the kitchen. 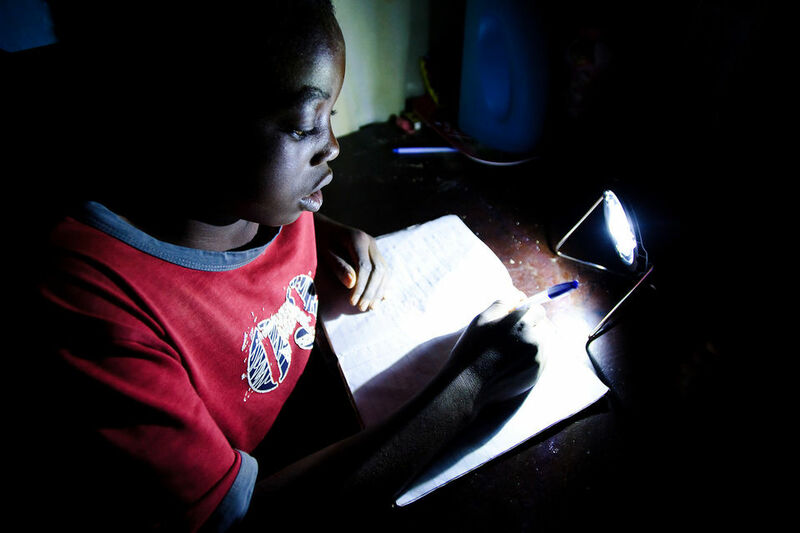 Although the primary motivation for purchase is to provide light for children to study, SolarAid research suggests that lights are used for other purposes, and that the whole household benefits. With around five people per household, this gives about 2 million beneficiaries. Results from 38 days of headteacher meetings in two regions of Tanzania in late 2012 show the significant reach that the campaign achieves. 93% of headteachers in the regions (whose schools account for 96% of pupils) attended a meeting, and over 5% of pupils purchased a light. Direct sales are already increasing this percentage. 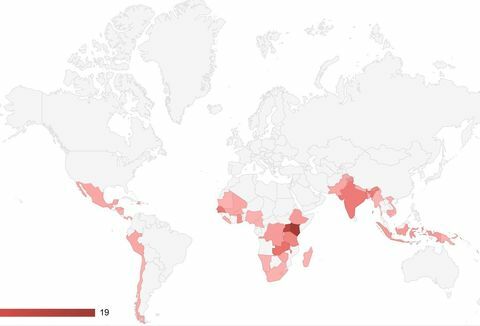 In 2012, SolarAid conducted an interview-based survey of 85 randomly-selected Tanzanian households who had been using their solar lights for between four and six months. The survey found that most people were happy with their purchase, with 74% ‘very satisfied’ and a further 19% ‘satisfied’. This high level of satisfaction is confirmed by the numbers of direct sales that result from the initial schools campaign: families see that their neighbours are pleased with their purchase, and therefore follow suit. ...families see that their neighbours are pleased with their purchase, and therefore follow suit. Student doing homework with solar light. Interviewees reported that studying was the most important use for solar lights (75%), and that study time increased for an average of one hour per night. This finding is supported by anecdotal reports on improved school grades. The other important uses were in the kitchen, and for general household lighting. Two thirds of the households surveyed had no access to electricity, and previously spent an average of US$1.60 (2,900 TSh) per week on kerosene for lighting. This reduced by 71% to US$0.50 (850 TSh) per week when they had a solar light. With this level of saving, the cost of a small study lamp is recovered in less than two months. It is not surprising, therefore, that saving money was the highest perceived benefit of solar lights, reported by 76% of survey households. Other benefits reported were the ability to study, the quality of light, and avoiding the smoke and fire-risk of kerosene lamps. Cutting the use of kerosene reduces greenhouse gas emissions. The CDM default value for this reduction is 0.092 tonnes/year CO2 e saved per solar light point (equivalent to about 38 litres of kerosene per year). On this basis, the SunnyMoney lights in use save about 36,000 tonnes/year CO2 e and reduce kerosene use by 15 million litres per year. The kerosene lamp that I use is affecting me because there is a lot of soot - that’s why I decided to buy this solar light. The money I used in buying kerosene daily, I can now use for other activities. Preliminary studies by SolarAid suggest that kerosene savings may in fact be higher: this will be assessed in detail in a carbon finance evaluation, which is under way. SunnyMoney employs 49 staff (24 female and 25 male) in the four countries where it currently works, 35 of whom are local. The field campaign teams are made up of three or four young graduates, with starting salaries similar to those teachers. The teams work to tight schedules with demanding targets and reporting processes. Staff gain experience in different roles, to share understanding across the organisation, and to give flexibility at times of peak load. SunnyMoney has a long-term aim to be active in 24 countries by 2020. In each country, the starting point will be a schools campaign, to raise awareness of the benefits of solar lighting and the SunnyMoney brand, followed by direct sales. After this, the intention is to establish a more permanent local presence by training rural distributors and developing SunnyMoney outlets in small towns. 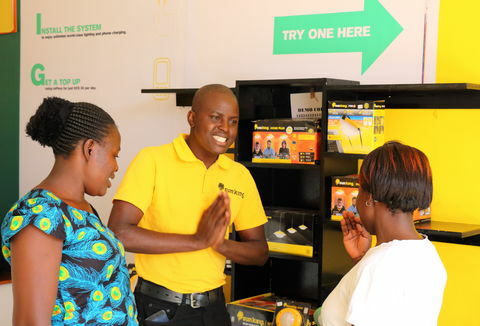 These will sell products like solar lights, efficient stoves and water filters under the SunnyMoney brand, and also provide repair and warranty-fulfilment services at a local level.